The Auratone 5C Super Sound Cube loudspeaker has a long and noble history in music recording. Its little six-inch wide cabinet and single small driver cone can often be seen perched atop the console meterbridge in pictures of classic studio sessions from the ‘70s and ‘80s, and its important mixdown role for some the biggest records of the era (the Bee Gees’ Saturday Night Fever soundtrack and Michael Jackson’s Thriller, to name but two) has been well documented. 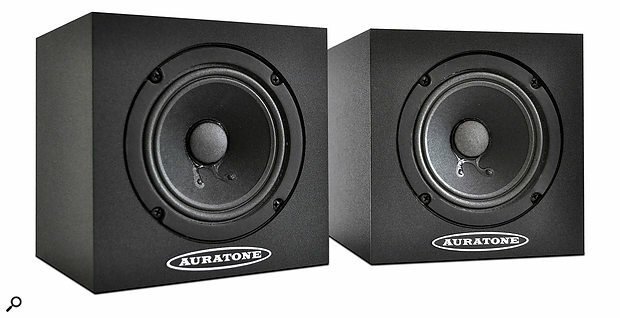 Indeed, some engineers used Auratones as their primary monitors during mixdown. There remains, however, a good deal of conflicting opinion about why exactly this little speaker was so popular. One line of argument is simply that the thing sounded so horrid that any mix managing to come through it reasonably intact ought similarly to survive playback through even the cheapest and nastiest end-user systems — an important commercial consideration for mass-market releases. However, while the speaker’s rather brash, middly timbre did earn it nicknames such as ‘horrortone’ and ‘awfultone’, this reasoning has always felt a bit questionable to me, because the speaker’s doped-paper-cone driver and closed-box cabinet actually deliver much lower distortion and better transient response than most mass-market playback hardware, even nowadays. More important than the speaker’s supposedly ‘lo-fi’ quality, in my view, was its strong mid-range emphasis, which helps create mixes that translate better across a full range of different listening systems. You see, it’s the mid frequencies of your mix that’ll typically reach the largest number of listeners — low frequencies tend to be expensive and bulky to generate, so lots of cheap devices end up being quite tinny, while high frequencies are easily absorbed via obstacles in the listening environment, or else obscured by background noise. 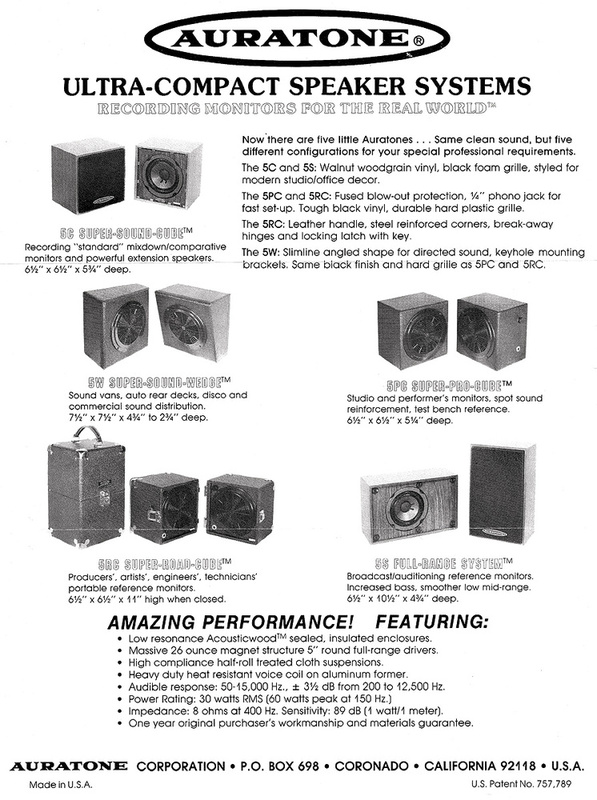 A key factor here was the speaker’s ability to reveal the intricacies of a mix’s balance, unhampered by the low-frequency cabinet/room resonances and inter-driver crossover distortions that frequently beleaguer larger loudspeaker systems. Adding to the potential for confusion is the fact that the Sound Cube actually went through a number of different revisions over the years. Although all these versions inevitably share some audible characteristics by virtue of broadly similar size and design, there were nonetheless significant sonic differences between them, and engineers may favour one vintage over another, depending on which aspects of the Auratone’s multi-faceted skill set they prize most highly. Auratone's founder, Jack Wilson, died in 2005. Enthusiasm for their former products continued unabated, however, and vintage units began fetching increasingly higher prices second-hand. Spotting a gap in the market, Avant Electronics began manufacturing the Avantone MixCube, their own updated take on the Auratone concept, in the mid ‘00s. The success of this product encouraged several other manufacturers to subsequently dip their toes in the water, too — most notably Behringer with their C5A and C50A. Now, however, the story has come full circle, because descendants of Jack Wilson have brought to market a new speaker that they’re billing as the most authentic recreation of the classic Super Sound Cube available. As you’d expect, the redesign is visually very similar to its celebrated forebear, although some new materials and components have had to be used where the originals are no longer available. The cabinet is built of sturdy 16mm MDF and finished in smart matte-black laminate. The solid binding posts at the rear will accept either bare wires or banana plugs for the amplifier connection, and I drafted in a classic Quad 303 amp for my own testing, lining the new Auratones up against a pair of 1980-vintage 5Cs, and my own Avantone Active Mix Cube. On first listen, I was rather taken aback, frankly. My previous experience of several different Auratones has led me to expect an unforgiving, almost brutal focus on the mid range, combined with limited extension towards the spectral extremes, particularly the low end. By contrast, these new little speakers actually sound surprisingly pleasant, and significantly more hi-fi than the 1980 versions I had on hand. So, for example, the warm-sounding bass parts of Travis’s ‘Pipedreams’ or Madonna’s ‘Nothing Fails’ were both presented with commendable solidity and evenness on the new Auratone, whereas they completely fell off the bottom end of the 1980-vintage Auratones, and were only lightly sketched on the Avantone MixCube (which has always felt bassier than any Auratone I’ve thus far encountered). At the high end it was a similar story — high percussives and vocal breathiness were both transmitted more clearly on the new Auratone than via either of the comparison speakers. That’s not to say that the (in)famous mid-range emphasis isn’t in evidence. There was certainly the recognisable bump in the 1kHz region that I’d expected, as well as the general forwardness in the 1-8 kHz region, but these seemed to impart far less ‘horror’ to the tone than they did with other Auratones I’ve heard (including the 1980 models I compared directly), presumably on account of the new design’s greater overall spectral bandwidth. In this respect these speakers felt much less congested in tone than either of the comparison speakers, and (dare I say it) almost flattering by comparison. An advert for the original Auratone 5C. Questions of spectral character aside, though, the undoubted highlight of listening to these speakers for me is their precision in the time domain. Even the spikiest of percussion comes across with unflinching speed and detail, and effects tails and other background details are laid bare for close examination. By the same token, the depth perspective was excellent (something of a hallmark of closed-box designs for me) and the stereo imaging irreproachable. Switching from the new Auratone to the other two speakers under comparison, however, confirmed that they also performed well in this respect. On first impressions the Avantone felt a touch less clear, but after longer auditioning, I felt that this was more a consequence of the MixCube’s more subdued tonal personality than a significant speed issue. Choosing the specific vintage of Auratone to emulate for this reissue apparently involved extended listening tests among long-time company members and their audio-engineering contacts, with the eventual verdict that the 1985 model sounded best. This doesn’t surprise me in the least, since these new Auratones are certainly a more enjoyable listen than any other Auratone I’ve ever heard, or than the Avantone MixCube I’ve been using regularly for years, or indeed than any of the other half-dozen affordable closed-box single-driver speakers that have passed through my studio in recent years. Unfortunately, while this might constitute a ringing endorsement were Sound On Sound a hi-fi magazine, within the context of the roles Auratones typically perform in the studio, I think it’s actually a bit of a mixed blessing. My biggest concern is that the new Auratone’s extended frequency response didn’t give anything like the mid-range focus that was coming from either the 1980 Sound Cube or the Avantone in my side-by-side comparisons. Partly, this was a simple function of the new speaker’s remarkable spectral extension (particularly at the low end), but I think there’s more to it than that, because there also appeared to be something of a suckout around 500Hz — great for avoiding a boxy tone in general, but with the side-effect that the upper-bass frequencies frequently seemed to dominate over the lower-mid range somehow. Whatever the technicalities, though, the practical outcome is that there were frequently fairly drastic divergences in subjective balance portrayal when switching from the new speaker to either of the others under comparison. In some cases, it was enough that the vocal almost seemed to trade places in the pecking order with the snare, bass, or percussion, and some of my most well-worn reference tracks ended up sounding disconcertingly unfamiliar as a result — tracks I’ve heard on thousands of different listening systems and used extensively for critical mixing comparisons over many years. As such, despite the legendary reputation of previous Auratone speakers as a benchmark for mass-market translation, I can’t honestly say I’d want to rely on this new incarnation in that role. I think it’s simply too hi-fi sounding and scooped in the low mids. In this respect, both the 1980 Auratone and the MixCube outperformed it during my listening tests. I think it’s also telling that although my two comparison speakers had quite different tonal characters (the mid-range bias of the 1980 Auratone was higher than that of the MixCube, while the latter seemed more understated overall), there were seldom significant disagreements between them about the balance of a given mix’s musical essentials. Furthermore, I wouldn’t want to carry out critical lead-singer automation tasks on this new Auratone, as the relation between its recessed low mids and pushed 1-2 kHz region seems to have a serious impact on the perceived level of different vocal deliveries and pitch registers. In other words, it’d be easy to over-egg the level of a vocal syllable with a strong 500Hz component, while underplaying a higher note that happened to have plenty of energy at 1.5kHz. It doesn’t help, either, that vocal breathiness comes through very strongly, so it’s possible to be misled that a singer is well upfront even when they have negligible traction in the mid-range. For me, this is very much a dealbreaker, as vocal balancing is the most important task of single-driver monitoring in my own mixing workflow. The speaker’s mid-range spectral lumpiness also undermines my confidence in it as a tool for mix referencing, because a snare with significant low harmonics, for instance, might not appear as forward in the balance as something lightweight and snappier in the upper-mid range. Clearly there’s no such thing as a truly ‘neutral’ speaker, so such ambiguities arise to an extent with any listening system you use, but it’s a question of degree, and in the case of the new Auratone I personally found mix referencing undesirably hit and miss. All of which means that this product is something of a curate’s egg. On the one hand, I honestly think its revealing time-domain characteristics and comparatively wide frequency coverage actually make it a serious competitor to two-way nearfield systems in this kind of price range (even budgeting for an accompanying amp). However, I suspect most owners of small studios will instinctively baulk at the idea of using these little speakers as their primary monitoring system, however much anyone attempts to rationalise it. And on the other hand, I don’t reckon people with more expensive main monitors will be particularly well served by the new Auratone as a supplementary mid-range balancing tool — at least not by comparison with its most obvious competitor. Let’s hope, then, that the company’s product line may in future expand to include recreations of the 1970 or 1980 Auratone models, which I suspect might fill the mid-range-monitoring market niche more effectively. Many thanks to Jan Krause (www.studiokrause.de) for his invaluable assistance with this review. The new Auratone’s most direct competitor is Avantone’s MixCube. You can get this in passive form for very similar money, or shell out a bit more for the active version I used for the comparisons in this review. Although I’ve tried a number of other unported single-driver speakers, I’ve yet to hear any other mainstream product in this price range that matches these two options for time-domain fidelity and general clarity. Much cheaper than either of them are Behringer’s offerings, the C5A and C50A, but as I concluded in my SOS February 2012 review, in this arena you still pretty much get what you pay for. It’s the same company that made the classic originals. Single-driver, closed-box design offers time-domain precision, excellent depth perspective, and crystal-clear stereo presentation. ...which hamstrings it as a mid-range balancing tool. Mid-range response vagaries compromise comparative judgements when you’re A/B’ing a mix against reference recordings. The original Auratone company return with a recreation of their 1985 Super Sound Cube. In many respects a creditable monitor on its own terms, it loses out to the competition (and indeed some of its ancestors) in terms of mid-range insight. £340 per pair, including shipping and VAT.